Cast-iron pilasters, a metal cornice, interior hardwood paneling and a pressed metal ceiling are reminders of the varied remodelings of this early commercial building, constructed before 1884. The saloon and billiard parlor that occupied the first floor here in the 1880s and early 1890s was the uptown outlet for the Centennial Brewing Company, largest in Butte. The brewery was located along Silver Bow Creek, west of where Montana Street crosses it today. Like its immediate neighbors, this is one of Butte’s earliest substantial buildings. Dating before 1884, it documents various periods of use through a distinct sequence of visible alterations. The ground floor commercial space was originally occupied by a jeweler and a tailor. Furnished rooms were available at the back and upstairs, accessed by an interior stairway. The upper windows with their graceful brick arches are typical of this earliest period. A dry goods/notions and millinery shop next shared the commercial storefront. 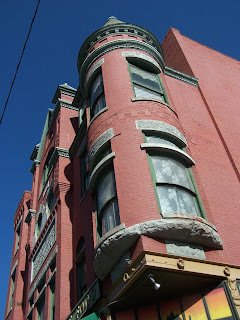 Butte architect H. M. Patterson designed a new façade in 1895, connecting this address with the building to the south. The cast-iron pilasters of that remodeling remain visible next door. In 1900, an inner doorway opened into J. V. Harmon’s saloon at 123 North Main. Clothing store owner Samuel Clerke installed the metal cornice in 1910, further linking numbers 123 and 125. By 1930, Hoenck’s Fur Shop occupied this building, once again separating the two addresses. Art Deco style metal sheathing, added circa 1940 and since removed, further chronicled the building’s alterations as its function changed over time. Like other buildings in this block, the backs of these two were damaged by a major fire in 1889, and the buildings were declared total losses, but they actually survived. 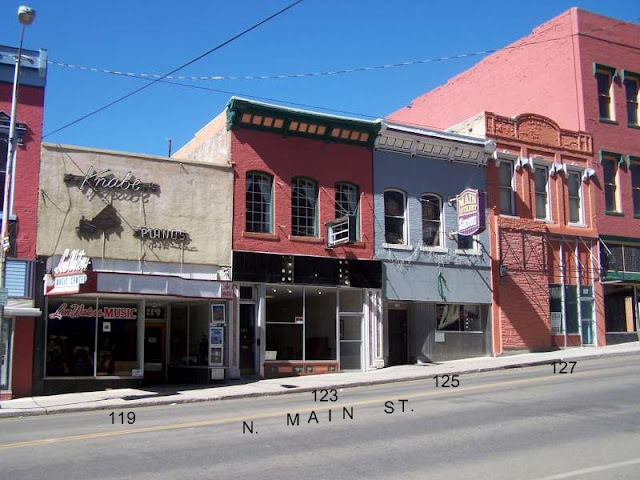 This block, excluding the north and south corners, is among the oldest intact sections of the Butte business district. Modified from historic plaques by Montana Historical Society. Photo by Richard Gibson. Butte’s early Catholic community established a mission in Butte in 1866, and the first parish church, a temporary wooden structure, was built west of this site in 1879. Father John Dols, the first pastor, arrived in the spring of 1881. The following year the cornerstone for a new church was laid, and formal dedication of St. Patrick’s took place in 1884. Two one-story wings were added to the original central portion in 1896, shaping the structure to its present appearance. 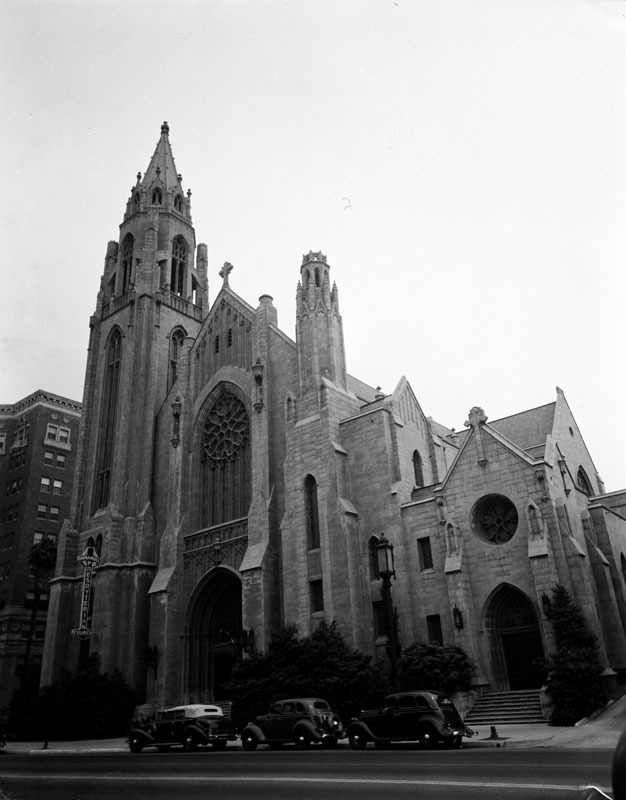 Although exterior remodeling in the late 1940s has somewhat altered St. Patrick’s original façade, the graceful spire and elegant Gothic arches reflect its original design. Most of the stained glass was replaced in the 1940s renovation. The parish had 2,500 parishioners by 1885, and was at 10,000 in 1901. 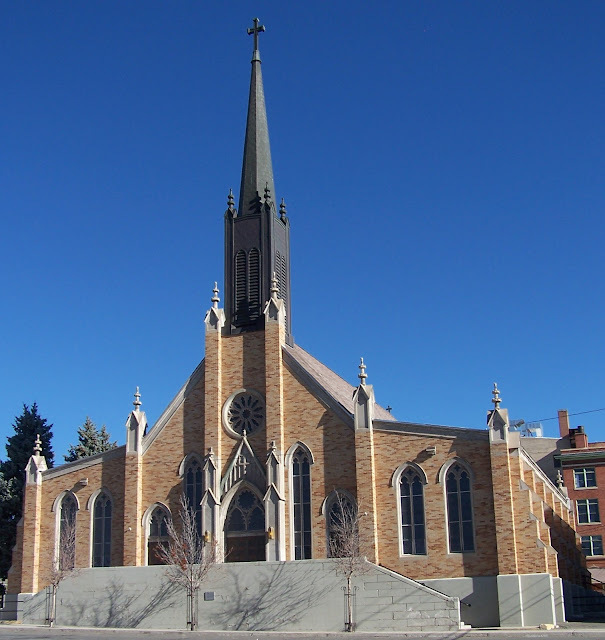 Modified from historic plaque by Montana Historical Society; additional resource: St. Patrick’s, in Historic Stained Glass in selected houses of worship, Butte, Montana, by Irene Scheidecker, published by Butte Citizens for Preservation and Revitalization, 2006. Photo by Richard Gibson. The T-shaped alley west of North Main between Broadway and Granite has been there with that geometry since before 1884. This three-story alley building, at the corner of the T, is connected by an overpass to 117 N. Main Street, part of the Dellinger Block. 117 N. Main (the first floor, north side of the Dellinger Block), the overpass, and the connected alley building all were built before 1884 as well. Various stores have occupied 117 N. Main Street, including a grocer, a hardware store, and men’s clothing stores. One of the first clothiers was Babcock’s; the name was superseded by his successors, Babcock’s managers Smith and Mattingly in 1900, and by Ignatius Mattingly alone from 1904 until 1925. The “Babcock’s” ghost sign here is pre-1900; the barely visible “Mattingly’s” over the garage door dates to the 1904-25 period. The overpass led to the second floor of the alley building, which early maps always label as storage. The ground floor was always essentially a garage. The third level shows on old maps as “sleeping rooms.” The access to the top level was by a stair on the outside (east face) of the building, marked by the white stripe on the photo above. The door to that stairway was in the south side of the overpass, which was variously tin-clad or iron-clad over time. 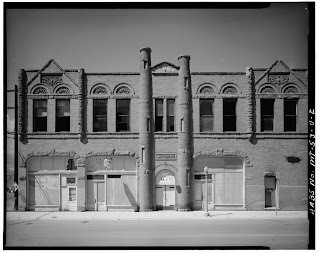 This building survived two fires, in 1889 and 1978, that destroyed buildings in what is now the parking lot to the north. The outside stair was removed years ago, leaving the third level inaccessible until 2011 when a new inside stair was constructed to provide access for tours. The alley building never had electricity, but both the second and third levels still hold the brass fittings for multiple gas lights, and both floors, small though they were, each had two stoves. 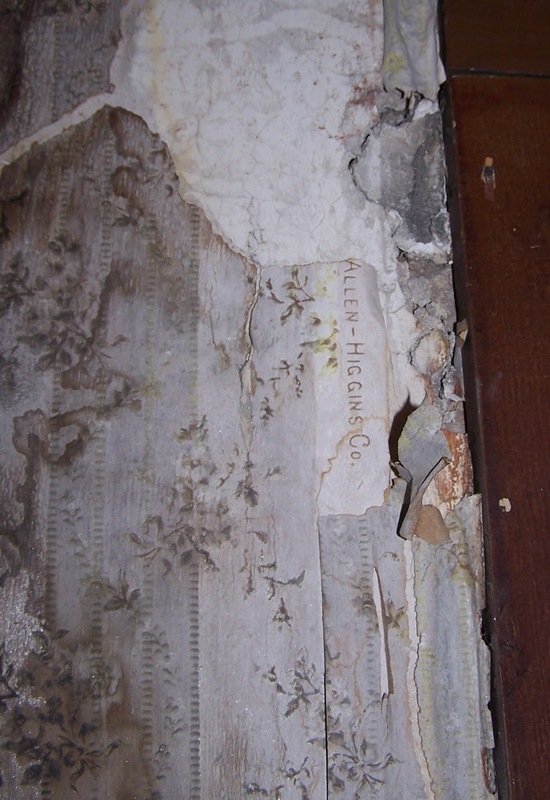 The top level is papered in fancy wallpaper made by the Allen-Higgins Company, a high-end wallpaper manufacturer in Worcester, Massachusetts. 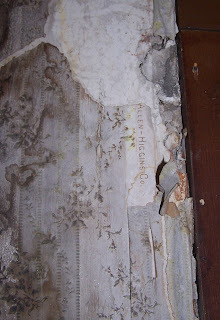 The Allen-Higgins Company started in about 1898, and there are two layers of older paper beneath their product. This space seems to have been a rather nice, double room, with two large closets which are also fully papered. While it is impossible to prove, it seems likely that the legend of this being a high-end two-crib brothel may be true; the wallpaper seems to be fancier than one might expect for a man’s sleeping room. This building is part of the Dellinger tour with Old Butte Historical Adventures. H. M. Patterson designed this residential building for J. L. Morris in 1898, replacing an earlier dwelling. A year later, Morris commissioned J. A. Riddell to add a storefront to the east at a cost of $9,000. Danish immigrant L. M. Brobeck rented the building in 1900, opened a grocery business on the ground floor, and lived upstairs with his family. The first floor, with its cast-iron storefront, reflects the 1899 commercial addition, while the upper floor displays Patterson’s lively creativity. Arches of quarry-faced stone, oriel windows, and decorative brickwork distinguish this pleasing building, which today continues its commercial function. From historic plaque by Montana Historical Society. Photo by Richard Gibson. 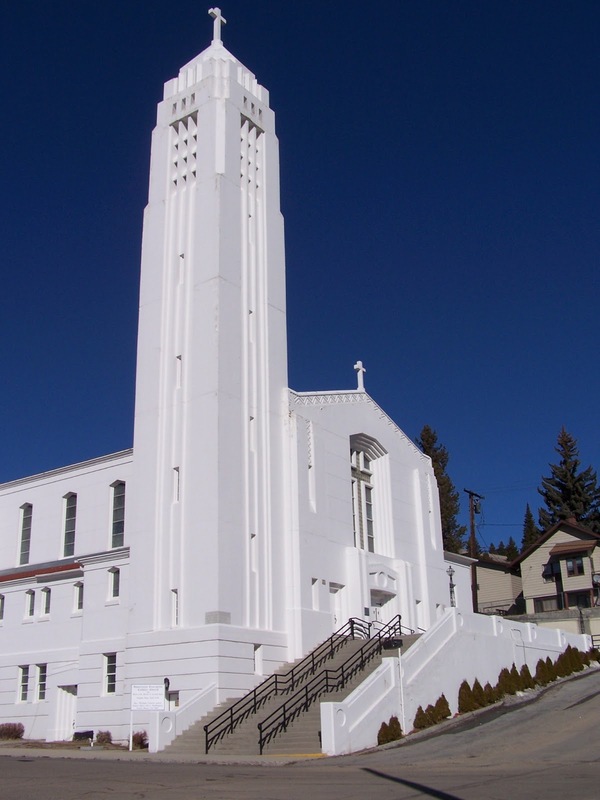 Designed by Scottish-born and Seattle-based architect B. Marcus Priteca (1890-1971), and built by Gus Forseen, Missoula contractor, the Washoe Theater opened to the public on September 24, 1936. The theater's structural architecture and elaborate interior decor are both outstanding examples of the contemporary art deco style. Construction of the 1,000 seat theater began in 1931, and was financed by the Washoe Amusement Company at a total cost of $200,000. Completion of this structure was delayed until 1936, due to financial effects of the Depression. From the street, the Washoe’s restrained brick exterior gives little indication of the breathtaking splendor that lies beyond the etched glass doors. Hollywood artist Nat Smythe prepared the designs and watercolor sketches for the interior and the original drawings are still maintained by the current owner. 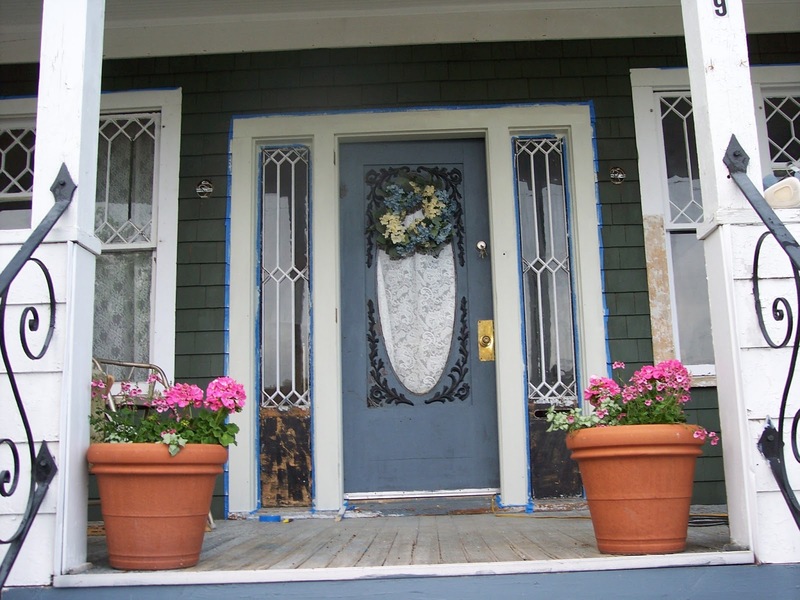 Colors of cerulean blue, salmon, rose beige, and yellow are enhanced by abundant copper plating, silver and gold leaf, and ornamental ironwork. Two magnificent stags are hand-painted on the blue silk plush curtain that graces the stage. Aside from the murals, executed by three expert decorators, decorative wall and ceiling work throughout the theater was the work of members of the Painters Local of Anaconda under Smythe's supervision. The applied decor employs pastel colors with eight shades of gold leaf in addition to burnished gold leaf on relief elements. 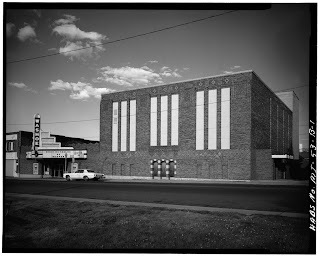 When first opened, the Washoe employed the latest projection equipment, and was the only theater in Montana to install a Western Electric “Mirrophonic” (stereophone) sound system, first developed in 1933 by Bell Telephone Laboratories. The interior decor also included draperies, a carpet, opera chairs, hardware, and sandblasted glass door panels all carefully selected to compliment the art decor scheme. Admission for first-run films in the 1930s was thirty-five cents. Today, the Washoe is one of the best preserved theaters in the United States, with original fixtures and equipment still in place and in use. It is all the more remarkable for its Depression-era birth, when movie theaters were built on a grand scale but no longer so opulently furnished. The Washoe replaced an earlier theater on the same site. The Sundial Theater, originally called the Margaret in honor of Marcus Daly’s wife, was built in 1897 and destroyed by fire in 1929. Sources: Photos by Jet Lowe (HABS/HAER, 1979, from Library of Congress; public domain). Text modified from HABS/HAER documentation, Monica Hawley, historian; and historic plaque text by Montana Historical Society. Additional resource: article by Dena Sanford in 2009 Butte Vernacular Architecture Forum Guidebook (PDF), p. 165-166. The Gagnon Realty Company constructed a single-story building on this site in 1914, adding the second floor before 1916. Mosaic tiles at the entrance proclaim the business of its early tenant, baker Joseph Boulet, who moved his Iona Cafe and Baking Company here from Park Street in 1915. 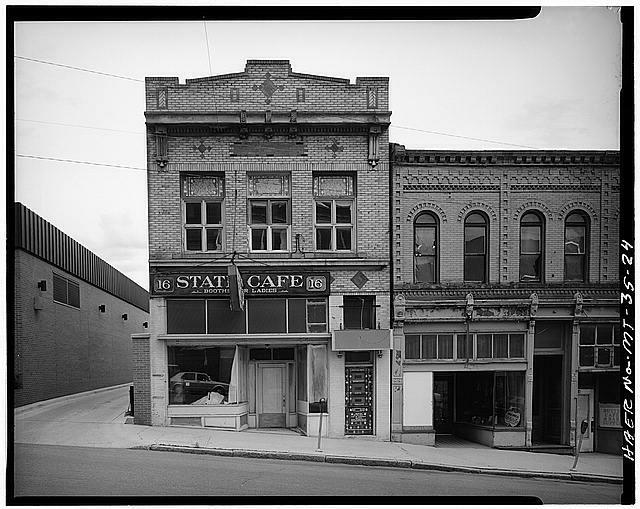 In 1917, the Iona became the State Cafe, and so it remained through the 1960s. An ornate metal cornice, decorative brickwork, transomed windows, and a sign for "Flor de Baltimore" painted on the north wall recall another era. Underneath the building is an excellent example of the subterranean passageways that crisscross the city. These passageways delivered steam heat to downtown businesses. See also this Butte History blog post. Modified from historic plaque by Montana Historical Society. Photo by Jet Lowe, 1979 HABS/HAER survey, Library of Congress. The prominent corner of Granite and Main Streets was occupied in 1876 by the Centennial Hotel, which opened on July 4 that year. After the hotel burned in 1888, apart from some tiny buildings, including a tailor's office, a news stand, and a fruit stand in 1891, the lot was largely vacant until 1897 when construction began on the Hennessy Building. In little more than a decade, entrepreneur Daniel Hennessy’s mercantile business became Montana’s first and most elegant department store. Minneapolis architect Frederick Kees designed the magnificent 1898 Renaissance Revival style showcase of steel, terra cotta, decorative glass, and wrought iron grille work to house Hennessy’s thriving business. The Anaconda Copper Mining Company added to the building’s prestige, moving its executive offices to the sixth floor in 1901. There the company reigned over its empire atop the city’s most modern building until 1977, when the Anaconda Company was acquired by Atlantic Richfield (ARCO) oil company. Façade restoration in 1989 by ENTECH, Inc., rejuvenated the building, which now serves as a major business center accommodating modern offices. Transom-level Luxfer glass panels focus light into the ground floor. "The Sixth Floor" became a pejorative term for the Anaconda Company, known in mining towns and union halls across the United States in the early 1900s. Modified from historic plaque by Montana Historical Society. Historic photo (1979) by Jet Lowe, HABS/HAER, Library of Congress. Modern photo (detail) by Richard Gibson. This building was the headquarters for the local chapter of the Ancient Order of Hibernians, an Irish fraternal organization first established in Anaconda in 1885. The A.O.H. auxiliary was officially organized on May 17, 1896 with 45 charter members. Today the Anaconda A.O.H. is one of the two existing chapters west of the Mississippi. The other is in San Francisco. D.J. Hennessy, founder of Hennessy Department Store, Butte, loaned the Anaconda A.O.H. division the money to build the Hibernian Block. The building was erected in two stages and cost a total of $30,000 to construct. In 1896, a one-story brick structure, measuring 50' x 80' was completed at the southwest corner of East Commercial Avenue and Cedar Street. The building included two storefronts at the East Commercial Avenue facade, with three additional storefronts to the rear on Cedar Street. 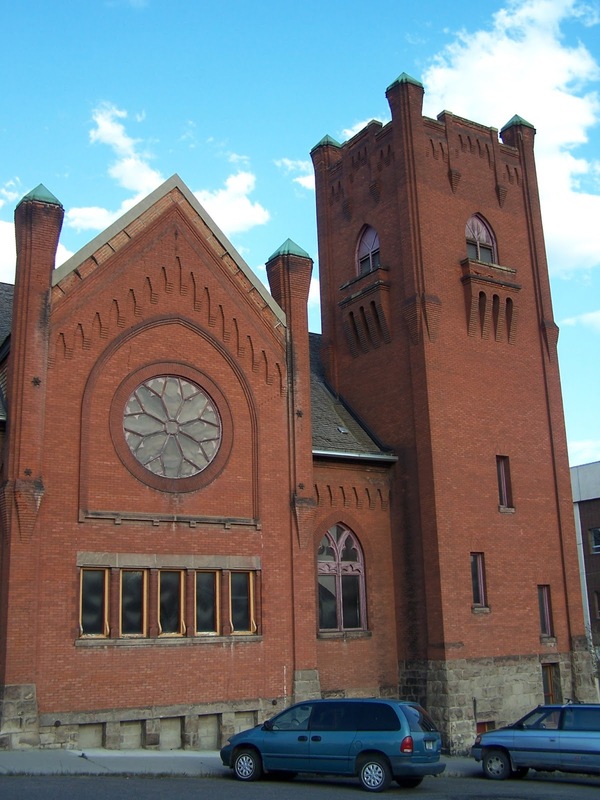 The second building, expanding the overall structural dimension to 50' x 140', was begun in the spring of 1898 and completed in early January, 1899. Pressed brick with trimmings of sandstone, granite, and terra cotta were used in both portions of this structure. When completed, the A.O.H. Hall was equipped with electric lighting, steam heating, and other "modern" conveniences. This hall was the center of all A.O.H. activities until January 1977 when it was purchased by the Urban Renewal Department of the city of Anaconda for $50,000. In the late 1970s it was under the ownership and supervision of the Community Development Agency. It was demolished c. 1985. The General Offices of the BA&P Railway formerly served as the passenger depot and dispatchers office for this rail operation. Built in 1898, the two-story brick structure has rusticated granite window lintels and sills with a continuous granite belt at the top and bottom of the second-story windows. The windows also feature overhead semicircular arch transoms. Dentilled and corbelled brickwork appears along the roofline at each building facade. The east end of the building has rounded corners, while a rectangular wing extends from the west end. The BA&P was incorporated October 1, 1892, and began hauling copper ore from the mines at Butte to the smelter at Anaconda by the close of 1893. The line also provided passenger service to Anacondans from this building location from the time of its construction until April 1955. Originally steam-powered, the BA&P Railway was, by 1916, the first fully electrified railroad in the United States, and the first heavy-haul electrified railroad in the world. In the 1960s, diesel locomotives replaced all the electric models. Sources: Photo by Jet Lowe (HABS/HAER, c. 1979, from Library of Congress; public domain). Text modified from HABS/HAER documentation, Monica Hawley, historian. Reference: Wired for Success: The BA&P Railway, 1892-1985, by Charles V. Mutschler (Washington State University Press, 2002). 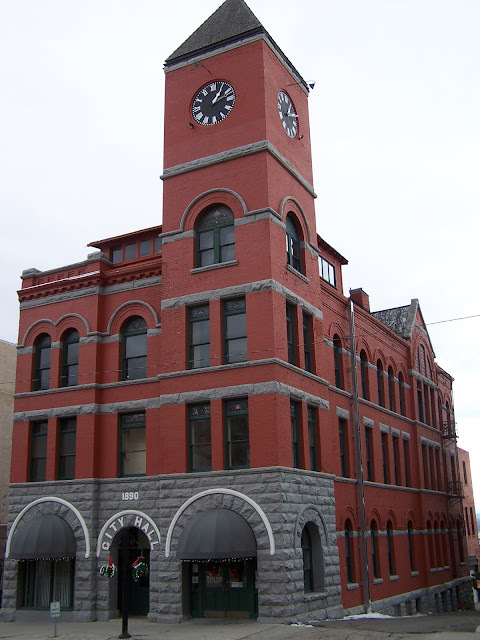 The Anaconda City Hall was designed by Lane and Reber, architects, and constructed in the years 1895-96. $34,000 in bonds were voted by the city for the construction of this building, and the contract was given to Jacobson and Company of Anaconda. This three-story brick building consists of three large bays at the west facade with a two-story addition to the east. The Fire Department's Engine House is located at the rear of this structure, while the front portions of the ground and second floors contain a court room, clerk's office and attorney's office. The original plans for City Hall, prepared by Charles Lane, incorporated a 90-foot semi-enclosed tower housing a four-sided Seth Thomas illuminated clock. A 25-foot bell tower was later added to the east end of the building. Both towers are now removed. The overall building dimensions measure 53' x 102'; the main building measures 50' x 100'. The basement has 9-foot-high ceilings; the first floor, 14-foot ceilings; and the second floor 13-foot ceilings. Local materials, including Anaconda red pressed brick, monument quarry granite and Anaconda copper trim, were used to build this structure. 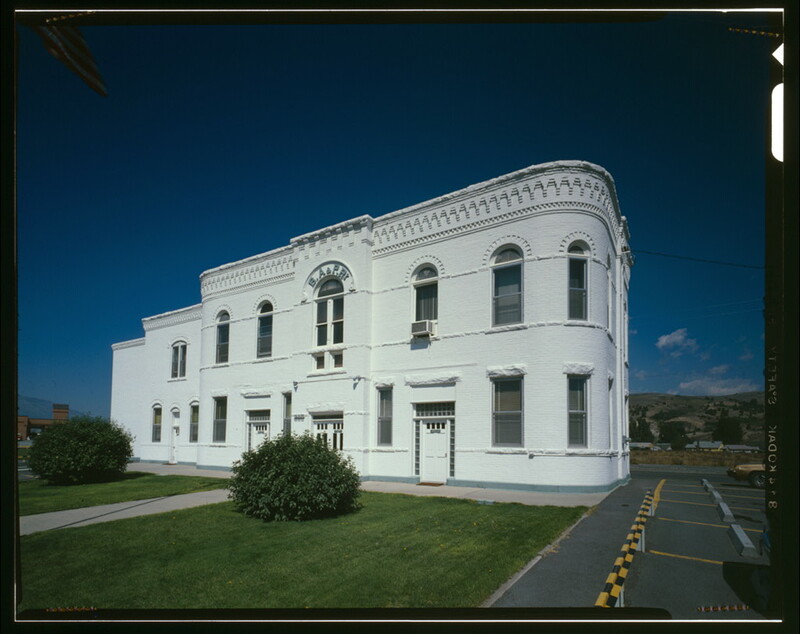 In 1897, the county seat was moved from the town of Deer Lodge to the City Hall building in Anaconda. 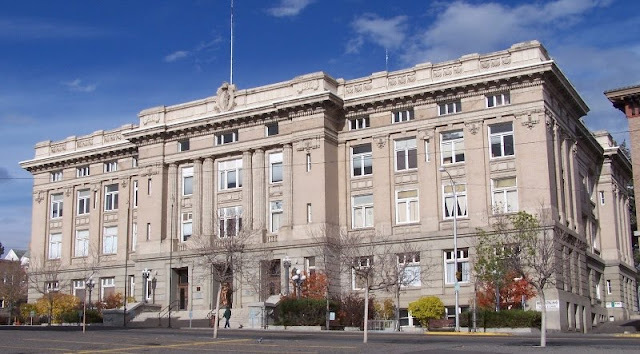 Deer Lodge County paid the city $2,000 annually to use this facility as the county court house until the present court house was completed in 1900. Sources: Photo by Jet Lowe (HABS/HAER, c. 1979, from Library of Congress; public domain). Text modified from HABS/HAER documentation, Monica Hawley, historian. A low-pitched gable roof, open porch, exposed rafter tails, and decorative knee braces identify this well-preserved example of the Craftsman style. Constructed about 1915, the home boasts its original windows, which feature a diamond pane motif and a unique oval-glass door. Built-in bookcases serve as room dividers; oak floors, a beamed ceiling, and a prominent fireplace (sadly, the original ornate mantel was stolen) ornament the living room. Architects lauded bungalow designs for their symbolism and efficiency. Low-pitched roofs gave “an impression of comfort and security.” The central hearth provided a symbolic focus for the family, and the interior use of wood (such as the ceiling beams in this house) brought nature into the home. Although it appears large from the exterior, amazingly, the house was originally built as a one-bedroom home. 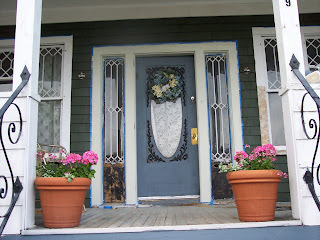 The front porch is not the original design. The Butte “granite” rock wall was added in the mid-1930’s. The Lowneys did it: cement mixer going, lights shining, yelling back and forth into the night. The two-car garage was built about 1960 by Marcelano Galetti, who matched the style of the house by incorporating knee braces taken from the house, and salvaged old, unmatched, carriage garage doors. Homeowners like Herman and Barbara Smith, who lived here from 1915 through 1949, embraced the bungalow style. Usually costing between $1,500 and $3,000 to build, bungalows put fashionable homes within financial reach of skilled craftsmen like Smith, who worked variously as an ironworker, ropeman at the Black Rock Mine, contractor, depot supervisor, and salesman. Smith built the house alternately with traveling to the Chicago/Detroit area to work there. The stocky, bandy-legged, mustachioed Smith could be seen trudging up the hill with his lunch pail under his arm after work. Barbara Murphy Smith was a seamstress and always had a silk handkerchief. David and Jeanette Stuart and family lived in the walkout basement during the Depression in the mid-1930’s. Later owners included Marce and Irene Galetti, their daughter Tiny (Galetti) Lorengo (1949-~1971), and the Ramey family (~1971–2003). The unsolved murder of Mr. Ramey took place in the west bedroom in 1972. The house was purchased in 2004 by Phyllis Hargrave who started the renovation. The end of a long court battle between Amalgamated Copper and renegade mine entrepreneur F. Augustus Heinze in 1906 brought about an unprecedented building boom. 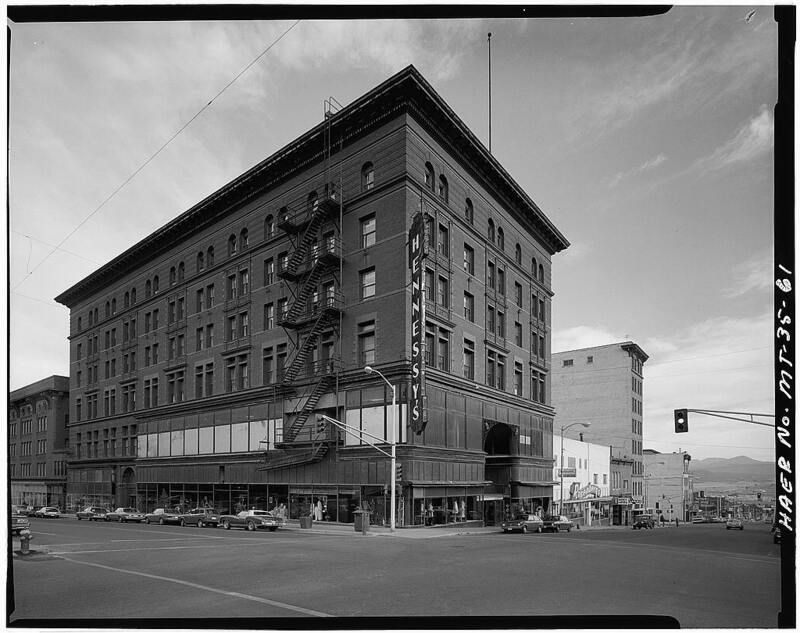 The Beaux Arts style, with its grandiose composition and exuberant detail, was the perfect façade to symbolize Butte’s new-found optimism. Prolific Montana architect George Shanley designed this three-story office building in 1907 for the Montana Independent Telephone Company. Home of the Butte Water Company since 1918, the structure, with its slender Ionic columns, arcade, and balconies, comprises one of a group of civic buildings in this expressive style. Text from historic plaque by Montana Historical Society. Photo by Stephen W. Henderson. Graceful arches and a lovely stone balustrade atop a stone cornice make this attractive Georgian Revival style building a perfect companion to the adjacent Water Company Building. Multi-paned windows trimmed in stone and brick, a dentil frieze below the cornice, and a pleasing symmetry achieved through door and window placement further define this popular revival style. Contractors Hans Pederson and George Nelson constructed the first floor circa 1909, and the second story was added in 1916 at a cost of $3,358. William V. Lawlor initially ran a real estate business here in 1909, but by 1910, James H. Rowe had joined him. The firm then became the Lawlor & Rowe Insurance Company, which handled real estate, fire insurance, and surety bonds. Text from historic plaque by Montana Historical Society. Photo by Richard Gibson. Turn-of-the-century critics called apartment living “a shortcut . . . to the divorce court.” These moralists believed that the proximity of bedrooms to living areas—and the easy access to both by neighbors—encouraged promiscuity, while apartment dwellers’ limited housekeeping duties encouraged a dangerous lack of domesticity among wives. Nevertheless, apartments increasingly attracted middle-class residents, particularly young, childless couples, older couples whose children had grown, and bachelors and working women, who didn’t need as much space as larger families. White-collar workers occupied the five-story, fifty-five-unit Mueller Apartments, built in 1917 as an investment by A. H. Mueller, president of Centennial Brewing Company. It cost $175,000 in dollars of the day, and was open for occupancy on March 10, 1918. The building incorporates Italian Renaissance style design elements: a symmetrical façade, a rusticated first story, keystone arches over the first-floor windows, and paired brackets and dentils under the cornice. Stained glass windows decorate the front entrance while a belt course and a distinct window pattern distinguish the fifth-floor penthouse apartments. These elegant, yet restrained architectural details announce the building’s respectability and, by extension, the respectability of its tenants, who included teachers, a doctor, salesclerks, accountants, and business owners. The Mueller contained 38 two-room and 16 three-room apartments when completed. They included kitchenettes, bathrooms, and a "Murphy-in-a-door" bed. Every apartment had outside windows, and the building's hallways were finished in mahogany. The basement contained a ballroom, laundry facilities, and storage. Reno Sales, Chief Geologist and Chief Mining Engineer for the Anaconda Company, lived in Apartment 507 here in 1928. Text expanded from historic plaque by Montana Historical Society. 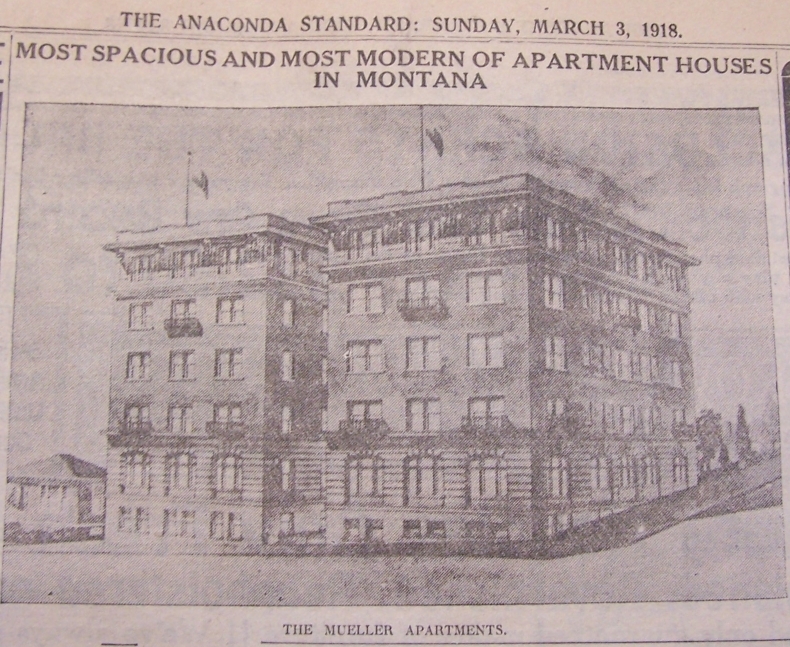 Additional resource: Anaconda Standard, March 3, 1918 (source of old photo). Modern photo by Richard Gibson. “Next to mining and smelting, litigation is the chief industry of Butte, and highly profitable to the lawyers,” reported a writer in 1901. One of Butte’s many lawyers, Frank T. McBride arrived in Montana in 1879. He and his wife, Rose, and son, Francis, lived in this two-story Queen Anne from 1896 to 1910. The home’s next owner also engaged in a traditional Butte occupation: saloon owner Frank Walker lived here in 1910 with his wife, Bertha, daughter, Georgia, and two boarders, a salesman and a miner. The height of fashion when it was constructed circa 1890, the house boasts many classic Queen Anne features including multiple bays, a round tower, a single-story front porch, roof cutaways, and an eyebrow dormer. These create the random changes in horizontal and vertical planes for which the style is famous. Decorative trim, elegant stained glass, and contrasting wall textures through the use of fish-scale shingles, brick, and stone complete the residence. The front porch was added before 1900, the attached garage before 1916. From about 1893 to 1896, Charles H. Palmer lived here. He was Superintendent (later, Treasurer) of the Butte & Boston Mining Company. He was also President of the Aetna Savings and Loan Company, with Lee Mantle as Vice President; and Palmer was Vice President of Patrick Largey's State State Savings Bank. 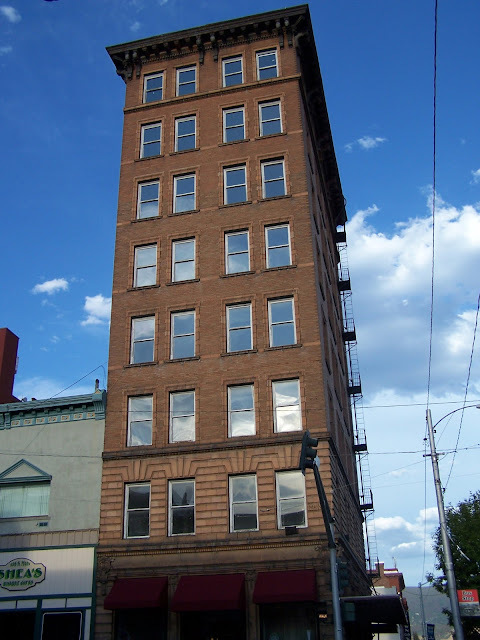 Palmer was in partnership with John Coram in various investments; Palmer & Coram were lessees of the Destroying Angel Mine at 35 West Galena Street in 1896, when Palmer lived here at 410 W. Granite. Palmer moved to Boston (1899-1906) but returned to Butte for at least two years, 1907-08, to serve as the general manager of the Davis-Daly Estates Copper Company. During that time, he lived at the Thornton Hotel and the Napton. Text expanded from historic plaque by Montana Historical Society. Additional resources, City Directories; and a tip from Irene Scheidecker. Photo by Richard Gibson. 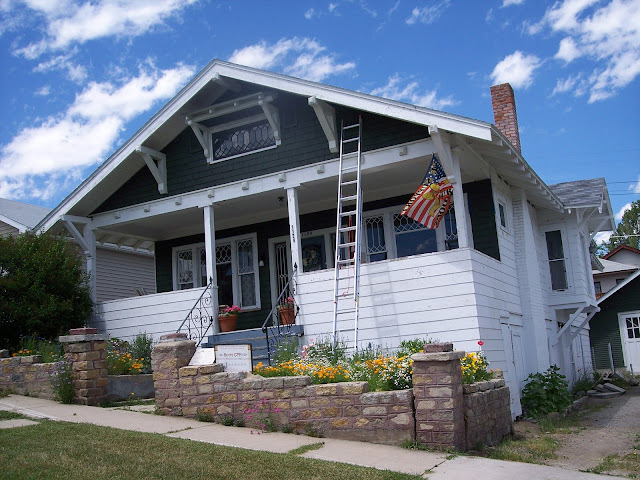 This miner’s cottage is typical of the style common on Butte’s West Side. Square footage is about 1,250, and there is a basement. Class distinction is evident on West Granite Street, with little homes like this one on the south side of a street (facing north) and mansions and mini-mansions on the north side where they could catch the warm winter sun. This was Myron Brinig’s home in the early 1900s. Myron Brinig was born in Minneapolis in 1896 and lived in Butte about 1897-1914. He began his career as a writer in New York City in 1918, and moved to Hollywood as screenwriter. He lived in Taos, New Mexico from 1934-77, and died in New York at age 94 in 1991. His best novels are about Butte and Montana’s turbulent years – Singermann, inspired by his father, a Jewish Romanian immigrant; Wide Open Town, about an Irish miner; and The Sisters, a Montana family story focused on the prosperous middle class. The grocery story at the corner of Alabama and Granite (now apartments), a block from the Brinig home, served as the setting for much of the novel The Sisters, made into a 1938 film starring Bette Davis and Errol Flynn. The eldest son of copper king William Clark built this twenty-six-room mansion for his bride, Katherine Quinn Roberts, in 1898. Massachusetts architect Will Aldrich reputedly modeled the residence after a French chateau the couple visited while honeymooning in Europe in 1896. The exterior features patterned brick enhanced by gray limestone, steep slate-covered roofs, and circular turrets. Yale-educated Charles spared no expense on details: exquisite stained glass, hand-painted wallpaper, a stately curved stairway, and the use of many kinds of rare woods reveal the work of talented craftsmen. 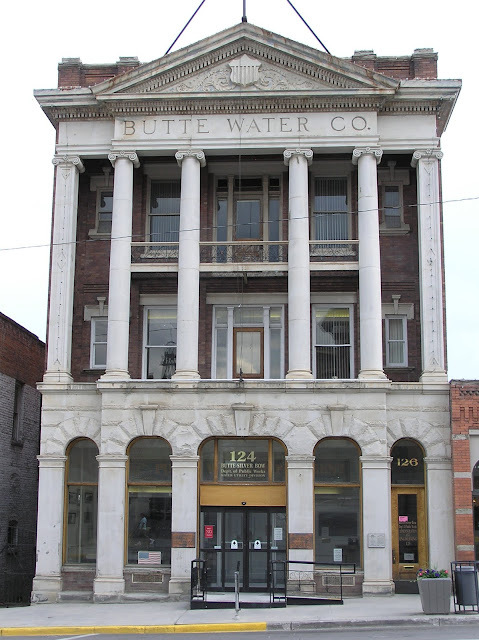 The building is owned by the city and county of Butte-Silver Bow. The chateau is independently listed on the National Register, as compared to automatic listing by virtue of being a contributing element of the Butte-Anaconda National Historic Landmark District (about 6,000 properties in Butte-Anaconda are National Register listed). From historic plaque by Montana Historical Society. Photos by Richard Gibson. Turn-of-the-twentieth-century social critics viewed apartment living as “the most dangerous enemy American domesticity has had to encounter.” Nonetheless, construction on the Leonard was begun in March of 1906 as Butte was experiencing an economic boom, and there was a great demand for rental units in the growing city. The site chosen for the Leonard was considered excellent at the time of its construction: "It is close enough to the business district to be convenient, and yet far enough out to be in the fashionable residence district." (Butte Miner, March 25, 1906). The Leonard was built from the start to house several classes of tenants. The spacious front apartments for wealthier tenants had extremely tiny kitchens; as the building featured a dining parlor in the basement, it was assumed tenants would take their meals there. In 1910, the Leonard Cafe advertised that it was “the best place in Butte to dine.” Patrons could enjoy a complete dinner for fifty cents. The apartments in the center of the building for middle-class tenants included full bathrooms and moderately-sized kitchens. At the rear of the building, apartments consisted of a single room with a closet and a sink; bathrooms were shared with other tenants. Many of the tenants in earlier years were single women: store clerks, teachers, and nurses. The Leonard was considered very respectable housing. The building is not quite square with Granite Street. 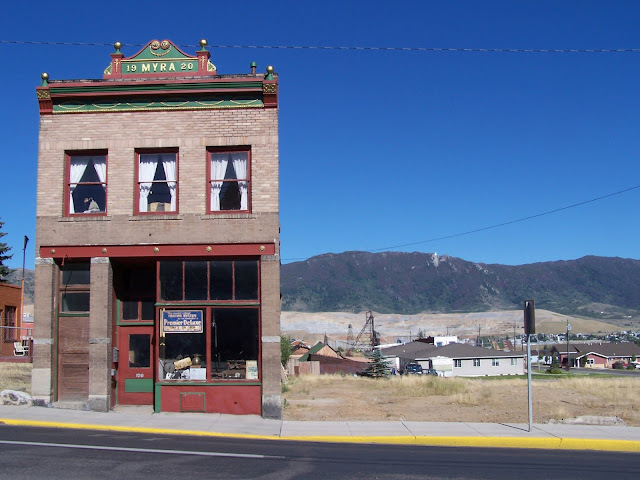 As with many lots and a few buildings in Butte, the front (south) side follows a mining claim, which is not quite coincident with the modern street edge. 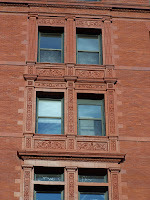 The photo above shows the asymmetrical cornice, which reflects this history. The cornice has been refurbished and repainted since this photo was taken, but the geometry remains the same as when the building was erected. The myth that Marcus Daly had the Leonard built to block the view of his nemesis, William Clark, whose mansion stands next door, is untrue. When the Leonard was built in 1906, Daly had been dead for 6 years and Clark was seldom at the mansion, as he was a Senator in Washington, D.C.
Resource: Historic plaque by Montana Historical Society; 1906 newspapers; property records. Photos by Richard Gibson. 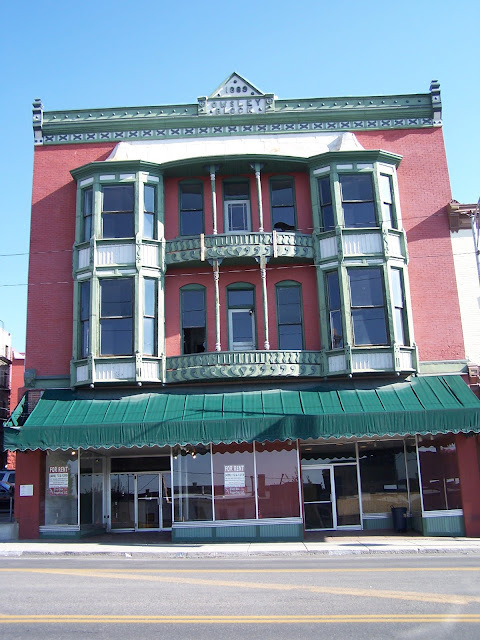 The Mother Lode Theater and the Finlen Hotel represent the only large buildings surviving in Butte from the last construction boom in the early 1920s. With the end of World War I, demand for copper declined precipitously, leading to a declining population and ongoing economic woes that discouraged major building projects in Butte. All of Butte's mines were closed for months in the early 1920s. This Beaux-Arts structure has four colossal engaged columns with Ionic capitals, lions' heads, decorative iron work, and multi-colored terra cotta highlighting its monumental façade. 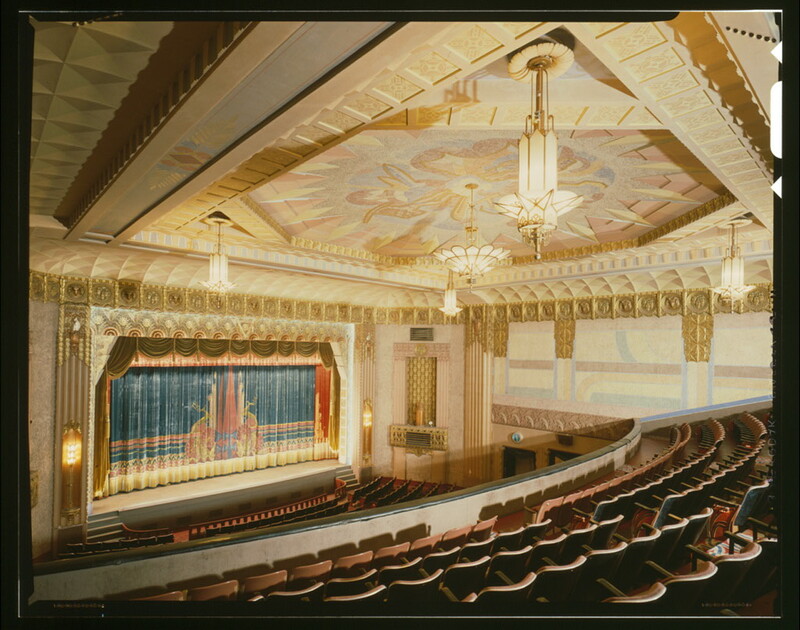 Art Deco interior features include the proscenium arch, whose openings are covered with fabric. The floor above the main theater contains a large ballroom presently used for set design and storage. Upper floors included offices and wardrobe facilities. The theater was built as the Temple Theater annex by the Masons, whose temple dating to 1901 is attached to the Mother Lode on the east and Masonic symbols decorate the facade of the Mother Lode. 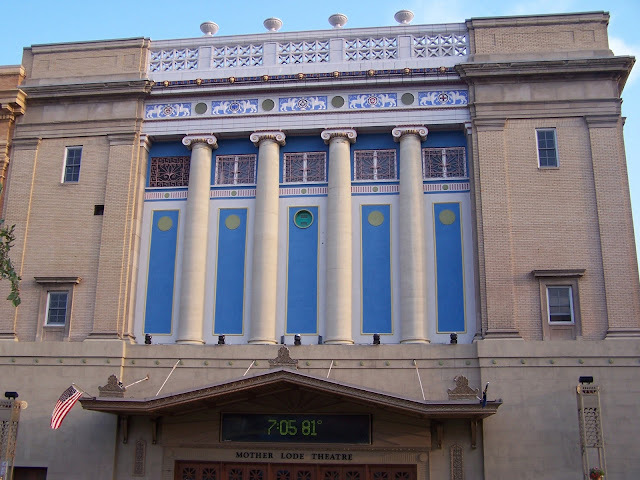 The economic and population decline led the Masons to lease their 1200-seat auditorium as a movie theater (the Fox) beginning in the 1930s. By the 1950s and 60s, it was known as the Bow, followed by a reincarnation as the Fox. About 1983 the Masons donated the structure to Butte-Silver Bow City-County, which immediately leased it to the Butte Center for the Performing Arts, a non-profit group that has managed the site since then. The organization raised more than $3,000,000 for a restoration project completed in 1996, including a new roof, electrical and plumbing refurbishments, a new stage floor, upholstery, furnace, and marquee. In 1997 a lower-level children’s theater seating 106 was added. 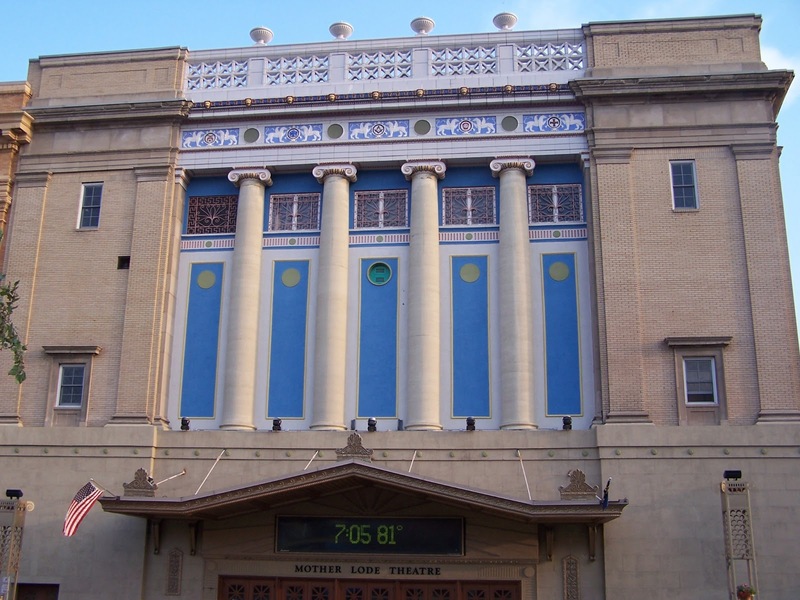 The Mother Lode Theater is home to the Community Concert Association, the Butte Symphony, Montana Repertory Theatre, Missoula Children's Theatre, Western States Opera Company, San Diego Ballet Company, and the Montana Chorale. 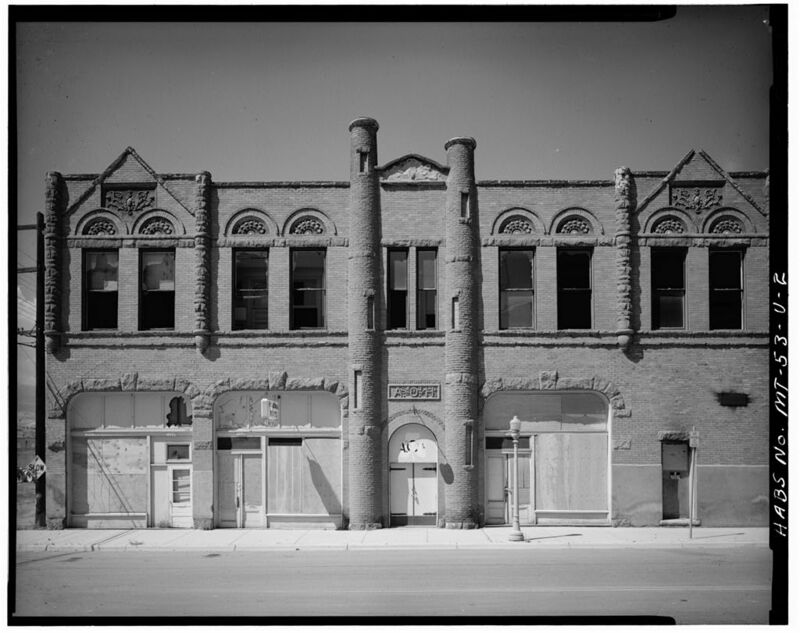 It is the only survivor of at least seven grand theaters from Butte’s heyday that hosted performers including Sarah Bernhardt, Enrico Caruso, Rudolph Valentino, Charlie Chaplin, and Mark Twain. First Presbyterian Church, designed by Henry Patterson. Architect Henry Martin Patterson was born at Savannah, Ohio, May 5, 1856, of Scotch ancestry. His father, John Patterson, a native of Aberdeenshire in Scotland, came to America in 1835, settled in New York and moved to Ohio in 1837, where he worked as a carpenter and builder. Henry’s mother, Christiana (Lawson) Patterson, a native of the lowlands of Scotland, came over in 1837. John and Christiana met and were married in this country, and had ten children, of whom Henry Martin was the seventh. John was an ardent abolitionist and his house was a station of the Underground Railway before the Civil War. Henry M. Patterson was educated in the public schools of Ohio and Savannah Academy. He learned the carpenter's trade and worked at it in Ohio until 1881 and in that year he moved to Butte. A. J. Gibson, prominent Missoula architect, got his start in Patterson’s Butte office, where both worked as carpenters in 1884. Patterson's first office, in the middle 1880s, on his own and teamed with Whitman & Whitney ("Carpenters, Etc.") appears to have been located on the north side of the alley between Broadway and Granite Streets, "2 east of Montana." It was behind the Congregational Church, whose site is occupied today by the Carpenters Union Hall today. Patterson roomed there as well. But about 1889 he established his architect's office in the Thornton Block; he lived in the Caplice Block. By 1895 Patterson had his own home on the up-scale West Side at 209 N. Alabama, moving in a few years up the block to 223 N. Alabama (still standing). After about 1900, his office was in the Owsley Block until 1902-03 when he moved to Seattle, a brief stop on his way to southern California. Patterson was the first architect to become a member of the Montana Society of Engineers. He married twice; his first wife, married in 1883, was Theresa Anna Scott, of Savannah, Ohio, who bore him twins, Charles and Bessie. They were born in 1886, and their mother died when they were a month old. In 1891 he was married to Miss Jeannette Willamson Andrews, of Chillicothe, Ohio. Patterson was active in the Presbyterian Church in Butte and in 1901 he was appointed to represent Montana in the national executive committee of the Sunday School union. He was also a patron of baseball teams in Butte. Patterson arrived in southern California about 1905, where he specialized in churches, although he also designed at least one theater, and hotels, residences, and other buildings. He died in Los Angeles October 20, 1928. Public library, Presbyterian Church, Inter-Mountain building, old Silver Bow Block, Broadway theater, Murray hospital, Mantle building. William Andrews Clark Jr. mansion, Curtis Music Hall, Lynch & Major's building, Columbia Gardens pavilion, Bowes block (destroyed by fire in 1889), Deer Lodge county court house at Anaconda, Good Templars Lodge, Hamilton Block, Stephens Block, Neuberg home (411 W. Broadway), 635 West Granite, 112 S. Main, original Thornton Hotel (53 E. Broadway), 123-125 N. Main, Kenwood Block. Among the numerous buildings Patterson designed in Southern California, two of the most notable are the First Congregational Church in Long Beach and the Immanuel Presbyterian Church on Wilshire Boulevard. Additional photos can be found here. Resources: Progressive Men of the State of Montana (1901); The Architect & Engineer magazine, Nov. 1928; Historic Uptown Butte by John DeHaas, Jr., 1977; Butte city directories. Photo by Richard Gibson. 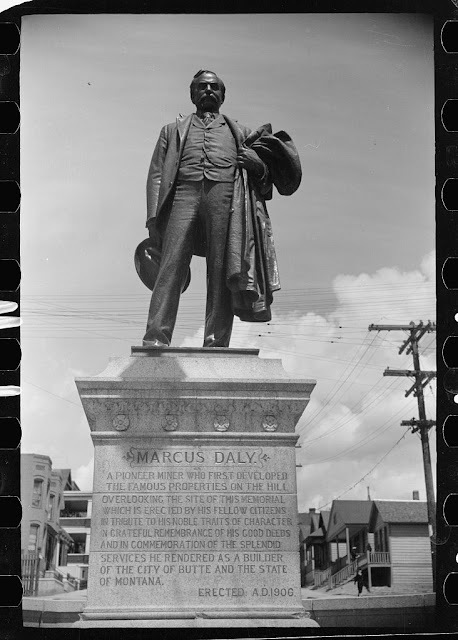 The statue of Marcus Daly, in Park Street at the edge of the Montana Tech campus, celebrates one of Butte’s Copper Kings. Irish-born Daly (born December 5, 1841, emigrated from County Cavan in 1856) came to Butte from Nevada’s Comstock Lode. He worked for the Walker Brothers at the Alice Silver Mine in Walkerville, where he made enough money to invest for himself in the Anaconda Mine, on the Butte Hill. In 1882, with demand for copper soaring to provide wiring for telephones and electricity, Daly’s discovery of the Anaconda copper vein marked the beginning of one of the largest mining companies in the world. Daly died November 12, 1900. The statue was commissioned in 1902 and completed in 1906 by Augustus St. Gaudens (1848-1907, and also Irish-born), designer of the U.S. twenty-dollar gold piece. The Daly statue was the last significant work of art produced by St. Gaudens; he died about a month before the statue’s unveiling September 2, 1907. It stood in North Main Street near the U.S. Post Office (today’s Federal Building) from 1907 until June 25, 1941 when it was moved to its present location. The move was spurred by vehicles colliding with the statue's base on Main Street, and was sponsored by the Butte Pioneer Club and Butte Citizens Committee, but paid for by Mrs. Marcus Daly. Photo (of statue when it was on Main Street) by Arthur Rothstein, 1939, Farm Security Administration, LC-USF33-003098-M5 (public domain, from Library of Congress). The strength of Butte’s early financial community is well represented in this monumental steel, brick, and stone skyscraper completed in 1906. 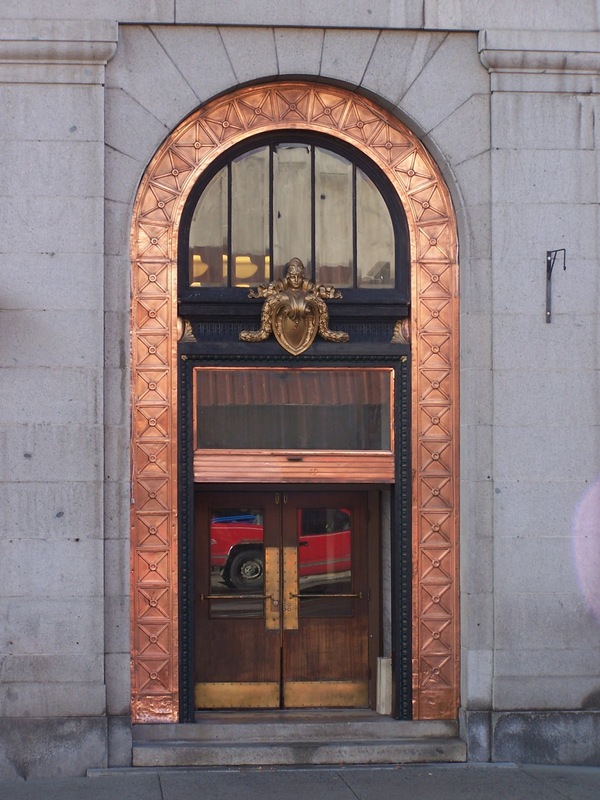 Copper king F. Augustus Heinze financed the $325,000 bank building, incorporating the newest steel-frame and curtain-wall construction techniques. Nationally renowned architect Cass Gilbert (1859-1934) drew the blueprints and Montana architects Link and Haire supervised the local work. Gilbert’s best known work is New York City’s sixty-story Woolworth Building (1913) and the U.S. Supreme Court Building in Washington, D.C. (1932-1935). 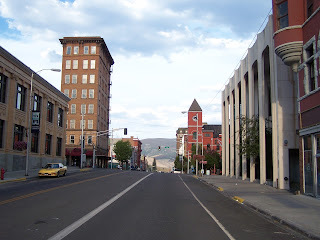 One of Montana’s first skyscrapers, the Metals’ eight floors add significantly to Butte’s urban skyline. A copper-trimmed entry complements the gray stone. Above, brick walls and stone arches culminate at the sixth floor. Ornate wrought iron balconies punctuate the second and seventh floors. The cornice and exterior window casements are copper, largely with a black patina today. An open wrought-iron staircase carries this element inside, where copper-trimmed windows with African mahogany frames and a marble-walled elevator lobby reflect 1906 Butte’s wealth. A huge polished steel bank vault recalls the building’s first use. Upper floors were renovated in the late 2000s to produce elegant loft apartments and condominiums. Modified from historic plaque by Montana Historical Society. 1979 photo from HABS/HAER survey, by Jet Lowe, via Library of Congress (public domain). 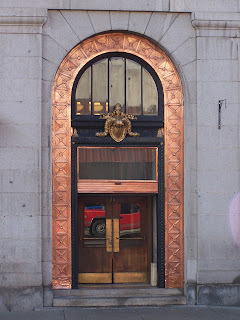 Photo of copper-lined door by Richard Gibson. A pair of two-story projecting bays, rounded balconies, and slender columns with ornate bracketing give this former hotel a delightful nineteenth-century charm. Built by early settler and former Butte mayor William Owsley, the Owsley Block housed the Hoffman Hotel (which offered rooms to let on the upper two floors) and ground-floor commercial space. A variety of early tenants included a drugstore, liquor store, restaurant, the Scotch Woolen Mills tailor shop, and Albert Keene shoes. In 1929, Hoffman’s still offered upstairs lodging. The bays have been faithfully restored to their turn-of-the-twentieth-century appearance and “mock” windows painted on the building’s sides indicate original window placement. Irish-born lawyer and businessman John H. Curtis constructed this lavish four-story Queen Anne style commercial building in 1892. 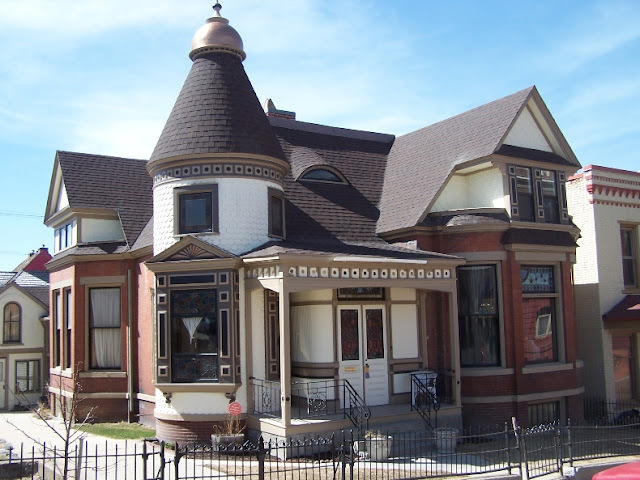 A skillful designer combined gables, turrets, arched and keyhole-shaped windows, carved stone, and decorative metal to produce one of Butte’s most treasured landmarks. 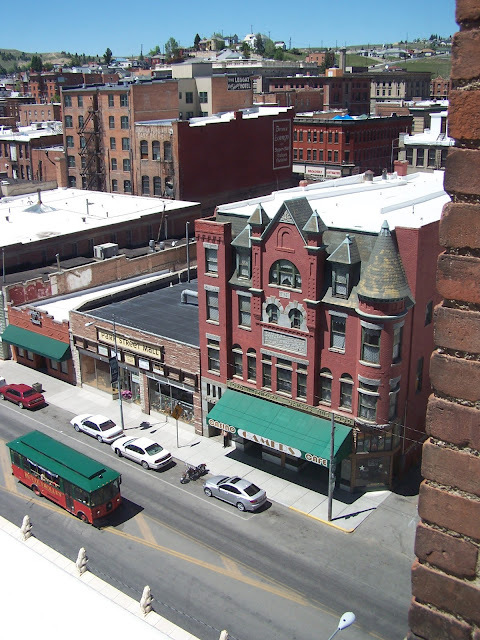 This outstanding showpiece of Victorian-era commercial architecture has served various functions including music hall, theater, saloon, and rooming house. While the untouched façade of the upper floors recalls the exuberant 1890s, the ground floor accommodated Gamer’s Confectionary beginning about 1904. Today it is a restaurant of the same name. Modified from historic plaque by Montana Historical Society. Photos by Richard Gibson. This is the second Silver Bow county courthouse to occupy the corner of Granite and Montana Streets. Built in the Beaux-Arts style and faced in part with 70-million-year-old sandstone from Columbus, Montana, the building cost about $385,000 – nearly as much as the state capitol in Helena. Basic construction is steel frame. Interior columns contain ducts designed to allow fresh air flow into the building. Rotunda door frames are granite, painted to resemble wood—one of many details that addressed Butte’s persistent fire hazard. Pink railings surrounding the rotunda on upper floors are cast iron with scagliola plaster coatings— colored and polished plaster designed to resemble marble. Genuine marble is found in the main interior steps, rest rooms, and decorative elements throughout the building, as well as in the pendentives supporting the rotunda dome. Two years after its opening, the courthouse served as barracks and headquarters for the militia that came to control Butte under three months of martial law in the wake of the dynamiting of the Miners Union Hall on North Main Street in June 1914. In September 1914, a Gatling gun was set up on the courthouse steps and a 5,000-candlepower searchlight was placed on the courthouse roof. The steps have seen visitors such as Eamon de Valera in 1919 and Franklin Roosevelt in 1932. Since 1977 when the city of Butte and county of Silver Bow merged, this building has been the sole seat of government for the city-county. Prior to 1977, the City Hall served the city and this building served the county. In 2012 the courthouse celebrated its centennial with a grand ball and other festivities. Shaffer Chapel was reportedly a gift to the African-American community from W.A. Clark. It was the second home to the African Methodist Episcopal congregation in Butte. 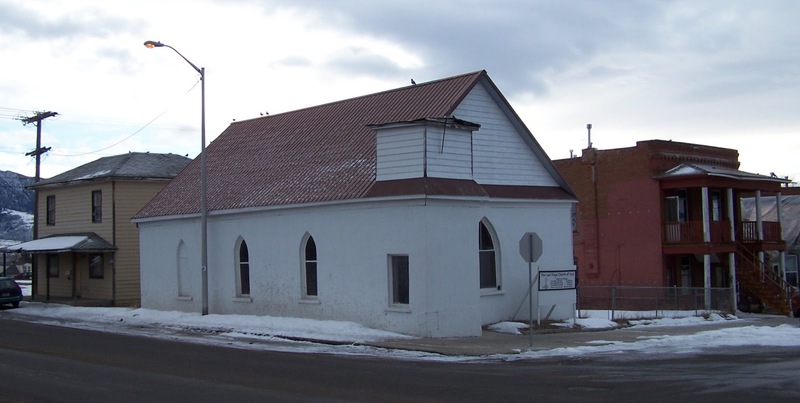 That group built its first church at Idaho and Mercury (where the fire station is today) in 1892, but after they moved to Shaffer Chapel, the original building became home to the Baptist Bethel Church which also served African-Americans. The building was vacant in 1951 but in recent years has been used as a day care center and as a church. See also this Butte History blog post on Booker T. Washington. The Immaculate Conception (I.C.) parish was established in 1906, but the parish school was built first, and the school’s basement served as the church for more than 30 years. Monsignor Joseph Willging, second pastor, spearheaded the fundraising—during the Depression—that led to construction of the church at a cost of $200,000. It was dedicated August 31, 1941. Stained glass in the I.C. church is unique in Butte. Much of it is in the Norman slab glass style, created by blowing molten glass into a rectangular, bread-loaf shaped mold. The cooled glass is spilt into five pieces, each of which has a much thicker center than edges, making for beautiful color tone variations. 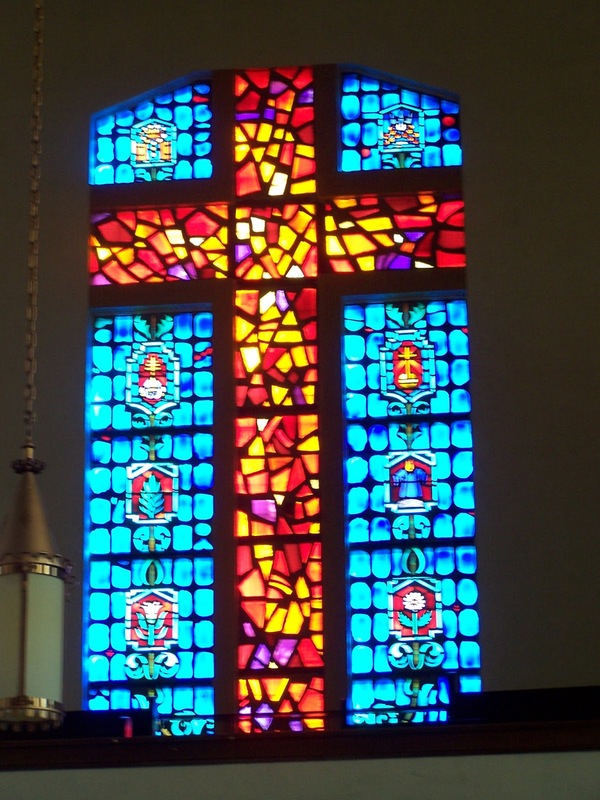 The cross in the eastern window contains a different style of stained glass. 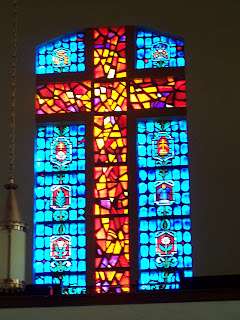 Originally, clear glass bricks comprised the cross, but the morning light blinded the priest facing that direction, so the original glass was replaced in a style called dalle-de-verre (French meaning “paving stone of glass”). Angular glass pieces are faceted and set into a stone-like matrix of concrete or epoxy. In addition to windows with religious themes, the I.C. 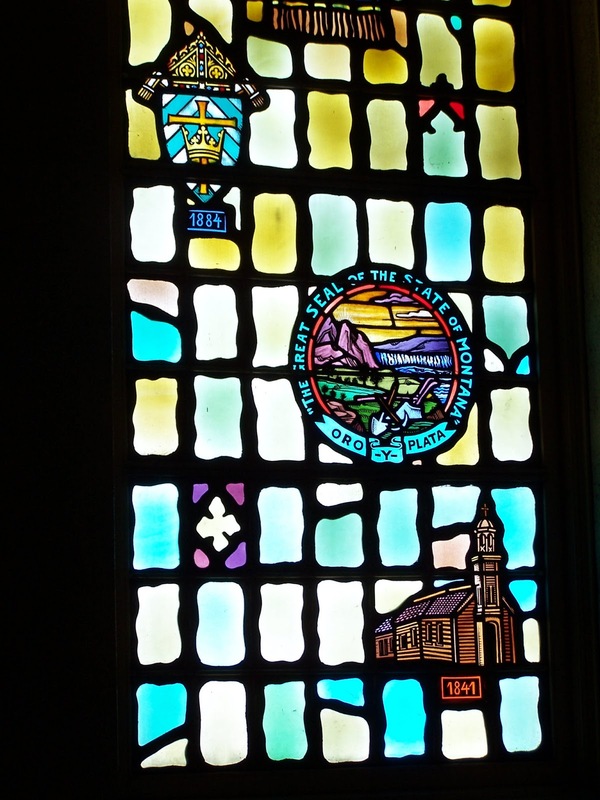 church stained glass commemorates organizations such as the Catholic Youth Organization and Boy Scouts. 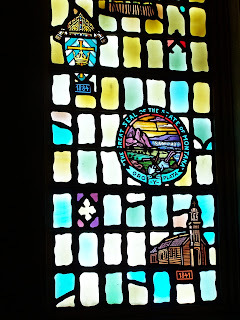 Montana history is found as well, with stained glass designs for the Great Seal of the State of Montana and the first mission church in Montana, St. Mary Mission built in 1841 in present-day Stevensville. The first Native American proposed for canonization, Kateri Tekakwitha, is also honored in the Montana Window. The I.C. 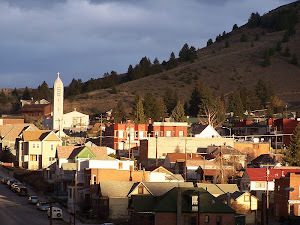 church spire is a prominent landmark just below Big Butte, and visible from most parts of the area. Resource: I.C. Church, by Irene Scheidecker, in Historic Stained Glass in selected houses of worship, Butte, Montana, published by Butte Citizens for Preservation and Revitalization, 2006. Labels: 1939, Churches, Immaculate Conception church, Link, stained glass, Western Ave.
Research indicates that this eight-story building is the second skyscraper (steel girder construction) west of Minneapolis and St. Louis (the first is the Call Building in San Francisco, erected in 1898). The building measures 58 by 28 feet and is about 90 feet tall. The basement, accessed through the public stairwell into the vaulted sidewalk, was the best-preserved sub-sidewalk storefront in Butte. Vaulted sidewalks were supported by brick or granite walls and floored with dirt or planks and contained grids of glass prisms to focus light into the vaults (a few survive on the South side of West Broadway Street near the Leggatt Hotel). The space here, restored to the 1928-69 Hirbour Barber Shop, was initially home to the Salvation Army, followed by a courier company (c. 1905-1928). The “secret” back room provided access to the rest of the building and was used as a private drinking establishment for the barber’s customers as recently as the 1950s; it was probably established during Prohibition at about the time the barber shop opened in 1928. The restored barber shop was removed in 2015 to make way for renovation of the basement for other uses. The tower contains a cast-iron staircase as well as cast iron window casements on the ground floor. 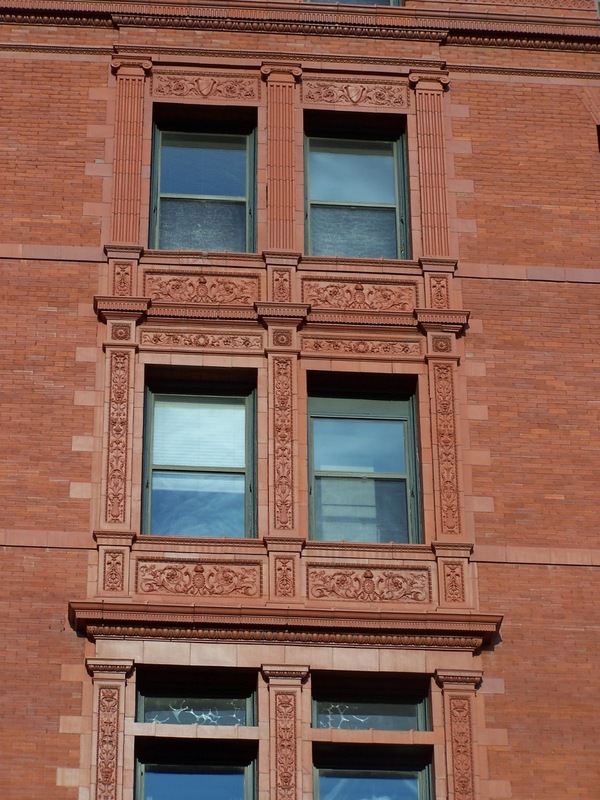 Emanuel Hirbour, who died before his building was finished, is memorialized in the terra cotta “H” emblems on the street-level façade. Although the two-story buildings to the north were present when the Hirbour was built, the north wall of the tower is essentially windowless, presumably in anticipation of later high-rise construction there. At least three different advertising signs occupied that wall over time, but all are faded to invisibility today. 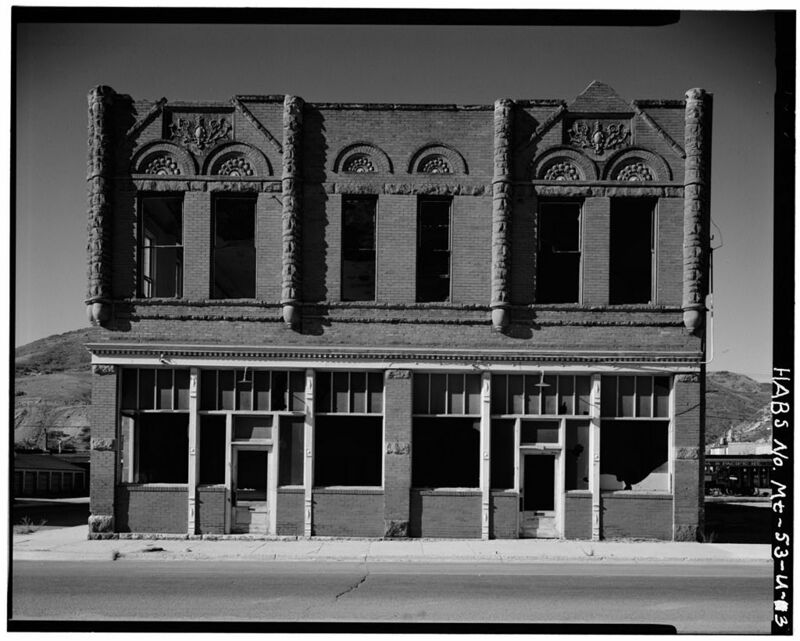 As was typical in Butte, the first floor was devoted to retail and the upper floors were offices. In 2012-13, the building was renovated to create condominiums on each of the upper floors. 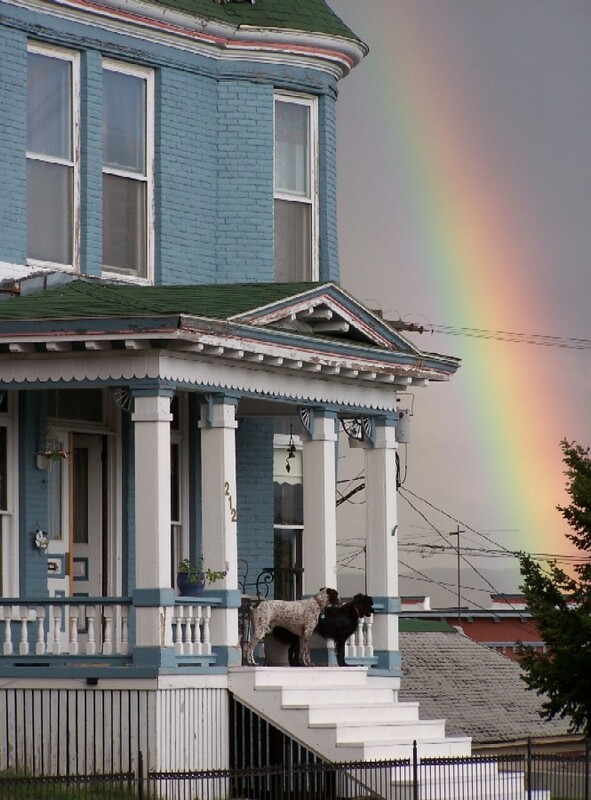 This stately Queen Anne mansion was built for William J. Alexander, a successful Butte grocer who came to Butte in 1880. The home rests on a granite stone foundation and is wood frame with brick veneer. The only alterations are a relocated third-floor stairway, and an addition on the rear (east) side. With its hilltop location and dramatic view west down Quartz Street, this prestigious home anchors the Hub Addition, developed during the building boom of the 1890s. 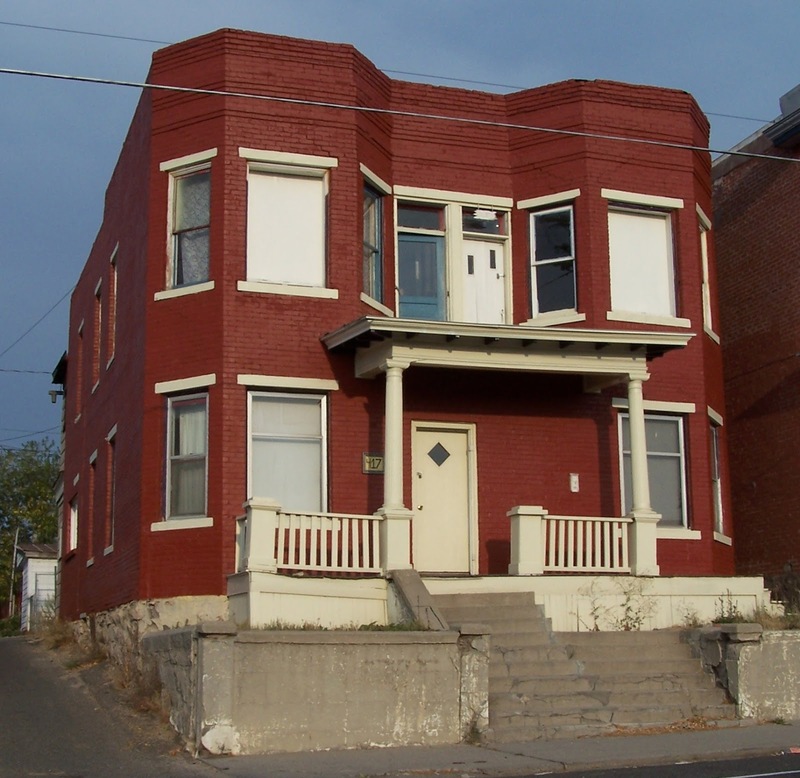 Set among less ornate middle-class homes, cottages, boarding houses, and a stone’s throw from the much later Mueller Apartments on Granite Street (1917), this building epitomizes the juxtaposition of class evident throughout Butte. 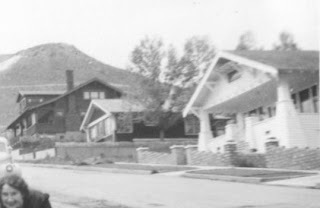 Alexander’s grocery was at 64 W. Park Street, but the neighborhood of this home was served by the Crystal Street Grocery one block south at Granite Street (northwest corner; closed after a 1973 fire; a vacant lot today) and Finley’s Grocery at Quartz and Jackson Street (southeast corner). This typical bay-fronted flat was home to controversial Butte author Mary MacLane from about 1900-1909. The structure is largely intact with some modification, damage and deterioration. The front porch is original; the back porch was originally Y-shaped with two independent, two-story porches that had stairs leading to a central platform and then to the ground. The open back porches were enclosed and connected to each level about 1915, when the bath was installed. Designed in the manner of a typical four-unit walk-up flat, this home was constructed as a two-unit duplex with internal stairs. 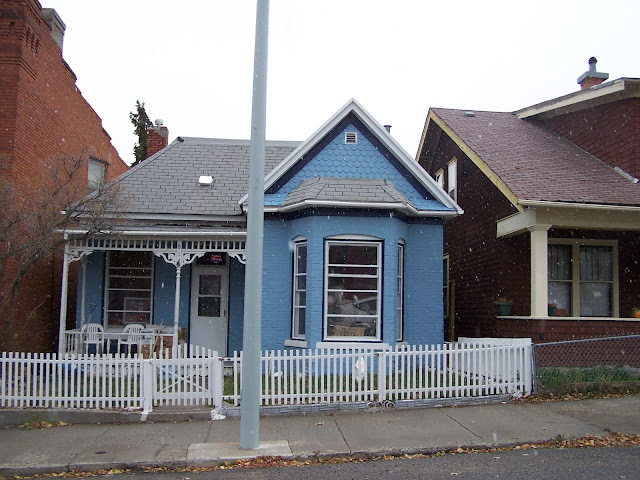 The duplex had a stacked upper and lower unit on the south and an upper and lower floor on the north; the latter was the MacLane home. Mary MacLane was 19 years old and living here in 1901 when she penned her famous diary, The Story of Mary MacLane. Shocking for its day, the diary expresses Mary’s eroticism and strange dreams with remarkable frankness. The book sold 100,000 copies in its first month and was cited by Ernest Hemingway and Gertrude Stein as an influence in their search for a new American writing style. Many interior changes took place over the decades with the lower floor opened to connect the two original units, forming a first-floor single-family home. The interior stairs were removed but the two second-story units remained, turning the house into a 3-plex prior to the beginning of restoration work. The removal of the internal stairs was a unique form of birth control undertaken by the family—the father was relegated to the south upstairs apartment after supper with doors locked to eliminate his midnight visits and the resulting children. The northern second-floor unit was usually rented at a minimal cost to a handyman or family friend. This building is not platform framed: its balloon-framed wood 2 x 4 studs are two stories high (or a bit more). It has 2 x 10 joists and a minimal attic with a relatively flat built-up asphalt roof sloped to drain to the back Leaking of the roof has been frequent. The home went through several rounds of tax default and repurchases at tax sales. One of the previous owners thought it would be nice to widen the narrow hallways upstairs by combining them and removed the central bearing wall, a problem that exacerbated the leaking roof. The building was offered and purchased on a county developer’s packet once; those owners defaulted and left town. 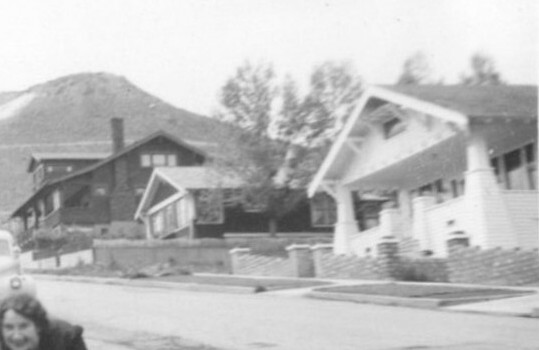 Ownership returned to the county and it was offered through a second developer’s packet procedure and acquired by Butte historians at a cost of $500. Restoration work is being diligently performed by volunteers and as an internship for the Historic Preservation Technology Program at the College of Technology Program at Montana Tech of University of Montana. 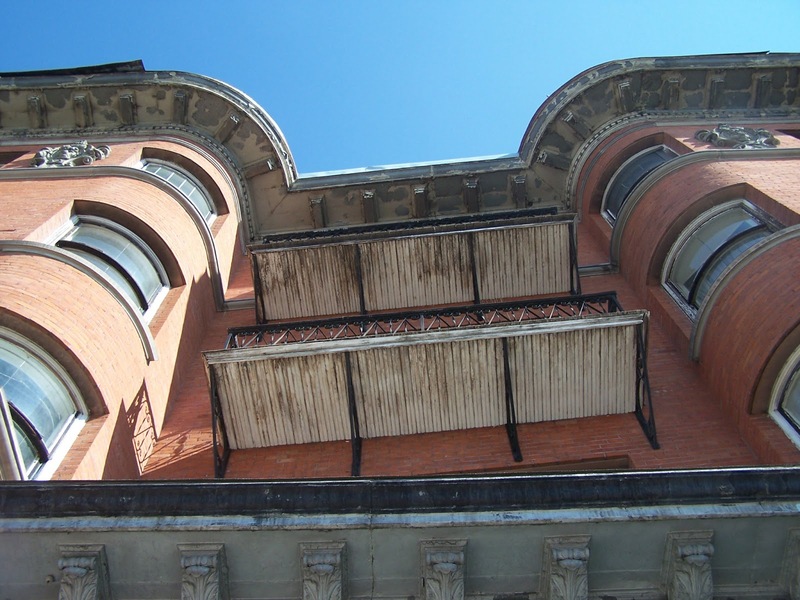 In 2012, Butte Citizens for Preservation and Revitalization granted $7,000 as a 50% match to replace the roof. Built: 1890. In use: 1890-1971. Butte’s exploding population – from about 4,000 in 1880 to 23,000 in 1890 – demanded bigger and better buildings for everything. 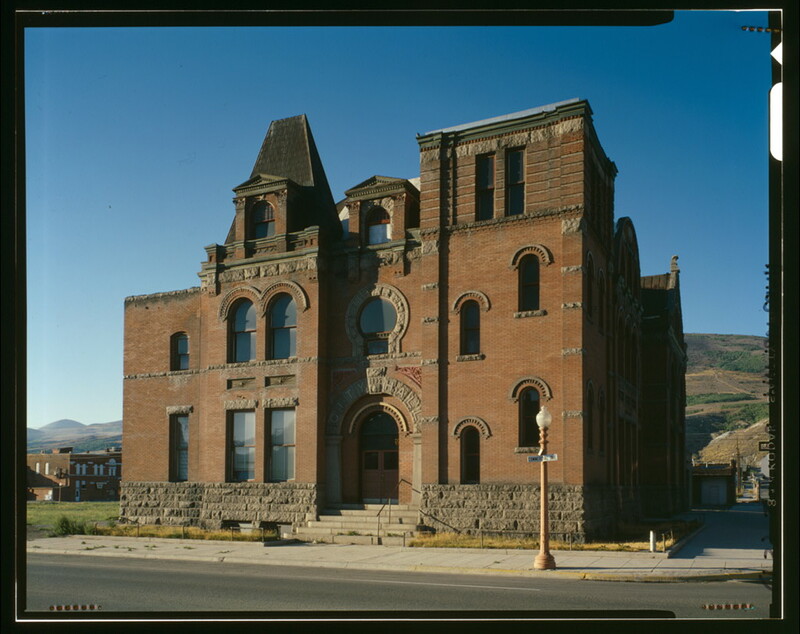 This is Butte’s second city hall, replacing the 1884 structure at 116 W. Park (now the Jail House Coffee Shop). Mayor Henry Mueller, also an officer of the Centennial Brewery, oversaw the construction of this building. The jail was known as the “Butte Bastille” for its dungeon-like character. No temperature regulation meant that the inmates suffered temperatures ranging from 100°F and more adjacent to the building’s boiler behind the drunk tank, to chilly discomfort in the more distant cells. North of the furthest cells (“dungeon” and “interrogation cell”) police offices occupied the sub-sidewalk space on the north side of the city hall, visible through the hole in the Interrogation Cell. The ceilings in those offices, and in the dungeon, consist of ranks of bricks laid on a metal lattice frame. Mortared unshaped granite boulders comprise much of the foundation, best seen at the corner of the long hallway along the cells. The main level of the city hall originally held the fire department. The large arches adjacent to the front entrance on Broadway Street were doors through which horse-drawn fire wagons passed in response to calls. By 1900, an additional dedicated fire station had been built (today’s Archives building, 17 W. Quartz) to help attack the all-too-frequent fires that plagued the city despite a 29-page building ordinance enacted in 1893 that mandated brick and stone construction for most business blocks. The clock tower has been lowered by one section from its original height. The jail was in use until 1971, when a suspicious (murder? suicide?) death by hanging at the shower stall compelled a decision to begin using the county jail (north of the county courthouse; currently the sheriff’s department offices), which was just 20 years younger but much more modern. 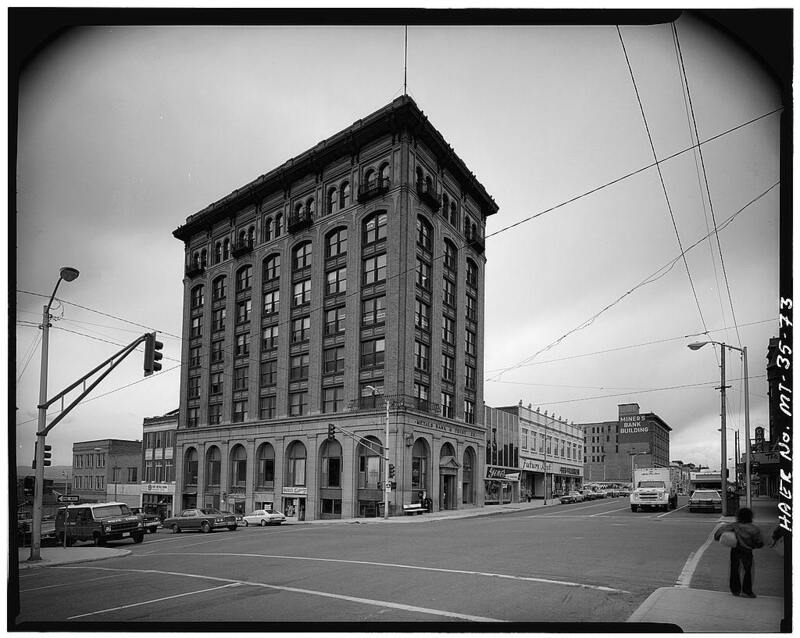 The upper floors of the city hall were abandoned in 1977 when the governments of the city and county were merged and all operations moved to the county courthouse on Granite Street. The adaptive reuse of the building as a doctor’s office dates to 1999. The oldest section of this building is the front 12 feet of the first floor, built as Tony’s Tin Shop in 1914-15. The shop grew to the east in at least two additions before 1920, when the second floor was added as a small boarding house. By 1925, the upper floor was rented to a couple who lived in the eastern extension of the second floor and who operated the front portion as a brothel according to family history. The family – Tony and Mary (Myra) Cononica, lived in the add-on section east of the first-floor tin shop. Original elements of the building are preserved because it remains in the same family; the tin shop has never served any other role. The boarding house/brothel upstairs is relatively small, and would have been a fairly upscale brothel, falling somewhere between the high-class parlor houses and low-end shacks called cribs. Tours of this building are available from Old Butte Historical Adventures. 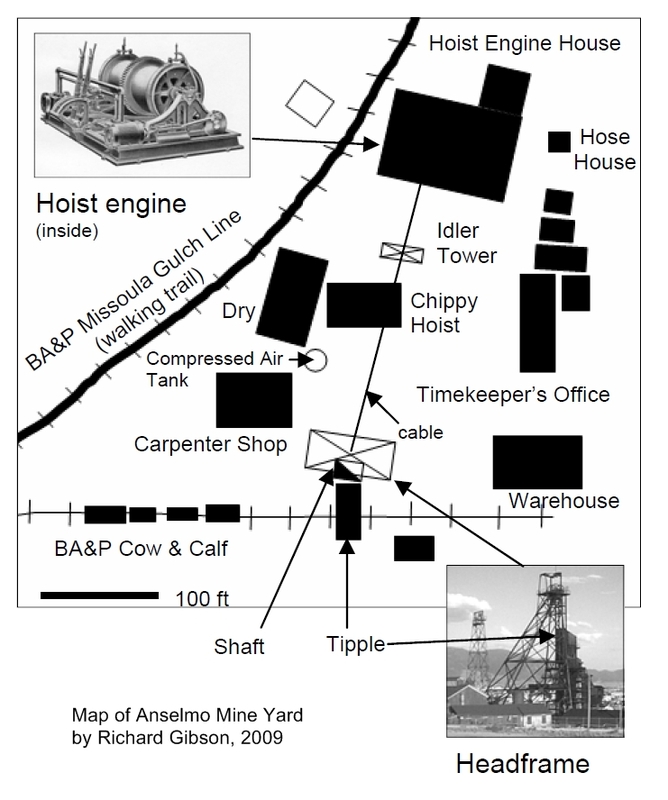 The Anselmo Mine operated from 1887 to 1959, and is 4,301 feet deep. 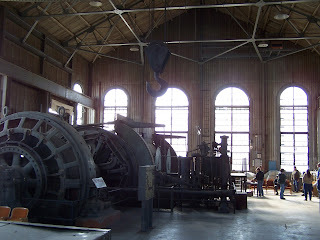 The mineyard is the most intact of any in Butte, and includes the main hoist engine room, an auxiliary (chippy) hoist building (with a lamp room in the lower level), carpenter shop, timekeeper's offices, hose house, the dry, and a warehouse in addition to the headframe with its tipple and two idler towers. The compressed air tank also survives. Inside, tools and other artifacts are found in place, just as they were when the mine was operating. The Anselmo was an important lead-zinc mine. It also produced silver and copper. The Anselmo and its mineyard are owned by Butte-Silver Bow County, which is working toward making the mine part of a Regional Heritage Park. 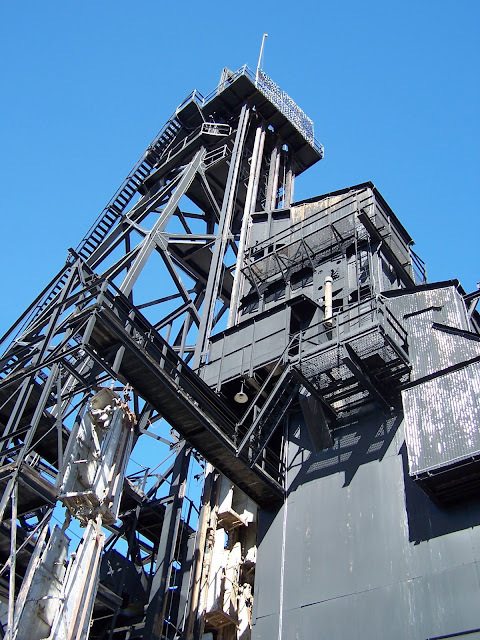 The present Anselmo headframe came from the Black Rock Mine, and was moved to the Anselmo in 1936. The Anselmo yard also held a timber yard that supplied lumber for underground timbers to many mines. The Anselmo was where timbers were treated with arsenic to prevent rotting; the main timber mill was west of Butte, at Rocker. A lengthy strike that shut down most of Butte's mines in 1959 spelled the end of the Anselmo, which did not reopen after that strike. The Butte, Anaconda and Pacific Railroad trail passes near the Anselmo yard. Not far to the west, the trail passes the Desperation Fan Tower, an octagonal concrete structure where bad air exited from the Anselmo mine. See also this collection of 1980 HABS/HAER photos of the Anselmo. Resources: A self-guided tour of the mines of Butte, Butte Historical Society; Guide to the Butte-Anaconda Copperway, by Richard Gibson. Photos by Richard Gibson. This article is modified slightly from its original publication in the Vernacular Architecture Forum Guidebook, Butte, 2009.